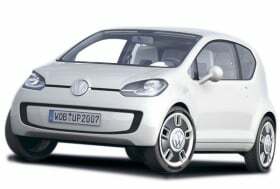 The VW Up, concept shown, is due to have a starting price of 10,000 euros when it arrives in 2011. Volkswagen plans to display the production version of its new Up minicar at the Frankfurt auto show next September. Deliveries of the Up are set to start in late 2011. The car will have a starting price of about 10,000 euros (about $14,000). "The final prototype phase is currently taking place for the Up," VW-brand development chief Ulrich Hackenberg told Automobilwoche. "So we will be able to start building near-production cars soon." When asked if the Up would get a two-cylinder engine like the one Fiat has launched in the 500 minicar, Hackenberg simply said: "That is a beautiful engine as well." The Up will be manufactured at VW's factory in Bratislava, Slovakia. VW plans a family of Up models, including a five-door version. The Up will offer traditional transmissions and later add a dual-clutch gearbox. A battery-powered Up is due in 2013, the same time that electric versions of the Golf and Jetta are expected to arrive. While developing the Up, VW considered putting its engine in the rear, but it decided on a front-mounted engine to help keep down costs. Hackenberg said that having the engine up front means that the Up's powerplants also should be suitable for the larger Polo subcompact.